There's been plenty of talk recently about Marilyn Monroe, namely her curvy figure and retro beauty (channeled so beautifully by Michelle Williams in "My Week With Marilyn"). The obvious point, of course, is how different beauty was back then than it is now, how the most beautiful stars of the Fifties had soft, womanly shapes as opposed to the yoga-toned, ab-tastic bodies of 2011. As if there was any doubt as to how far our body ideals have shifted, Retronaut has dug up (and Jezebel has promoted) these vintage ads from the 1930-1950s that promote weight gain. 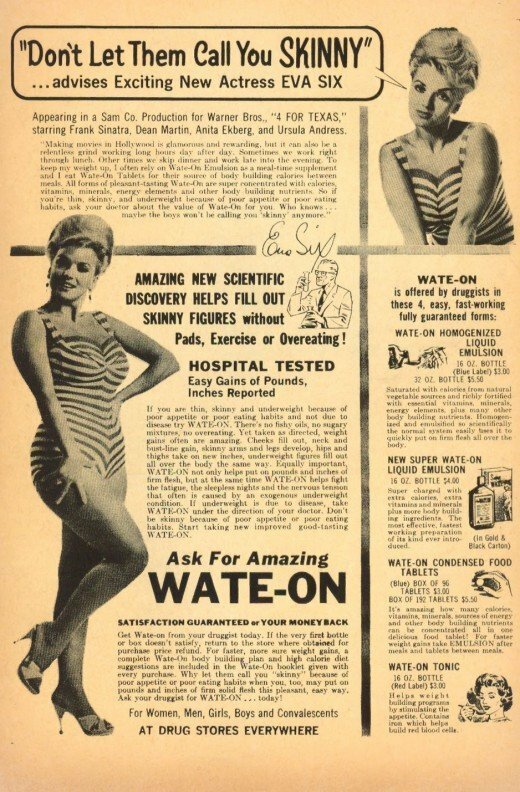 The ads tout scientific ways to "add attractive pounds and inches" (a complete oxymoron in this day and age) and "add glamorous curves to your figure." And it wasn't about health: the ads make it clear that being skinny or slender is the least attractive look. "If you want to be popular, you can't afford to be skinny!" screams one ad aimed at females. Another features a man lamenting, "A skinny man hasn't a chance... I wish I could gain flesh." It's as if all our modern notions of body image have been flipped on their heads -- replace the word "add" with "drop" in the vintage spots and they could just as easily fit right in today, when we're encouraged to drop pounds and lose curves. The 180 degree logic begs the question: what happened in the past 60 years? What happened between Marilyn Monroe and, say, Gisele Bundchen? Well, Twiggy happened, for one, along with the era of the mod Sixties gamine. Skip a few years forward years and you've got Kate Moss and the Nineties waifs. And today? Look no further than tonight's Victoria's Secret Fashion Show, where the models will hit the runway with little to no body fat and plenty of toned, tanned muscles. Below, take a dizzying trip back in time to an era when "curvy" wasn't a euphemism for fat and "skinny" was truly a bad word.